If I had a dollar for every time I heard the words ‘change’, ‘disruption’, ‘digital’, ‘shift’ and ‘challenging’ when speaking to you about your industry — I wouldn’t need to be speaking to you anymore to make a living. That's why NZ Marketing brought back the Agency Perceptions research. As in 2017, it partnered with TRA to open the floor for marketers to have their say—they are the ones who hold the purse strings after all. Those budgets are used to build brands and assess their perception in the market, but do agencies ever move the lens to see how they are perceived in their market? That’s why it asked 27 of the country’s most senior marketers about their frustrations, how their needs are changing, what they look for in an agency, how they chose the right partner, and which agencies stand out. The answers to those questions are available now in the 2019 Agency Issue of NZ Marketing magazine. While the research does show how marketers compare the performance of individual agencies, we hope you’ll take from this information that which will improve the relationships between agencies and clients. The research has also highlighted a few areas of movement as the results from 2017 differ from those of this year. Those findings in themselves provide some interesting guidance as to where your industry is heading. 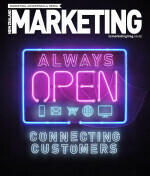 To get a copy of the latest issue of NZ Marketing magazine click here. like a small number, many of them were from the country’s biggest brands so they have a lot of commercial clout and are responsible for a large chunk of the country’s total spend on creative services and media buying. So, we think their views offer an important insight into the mood of marketing and the role of agencies.